So sorry to have this up so late on a Monday! Another crazy day it was, and this morning I had the great pleasure of my glucose test and blood draw, and I have to say, the drink itself wasn't nearly as bad as I was expecting, but the side effects were awful! I was shaking like a drug addict having withdrawls 10 minutes after I finished the drink, and that lasted up until the afternoon when I had a headache and major sugar crash. My fingers are super crossed that I pass, because I do not want to go for the 3 hour test if something turns up abnormal! 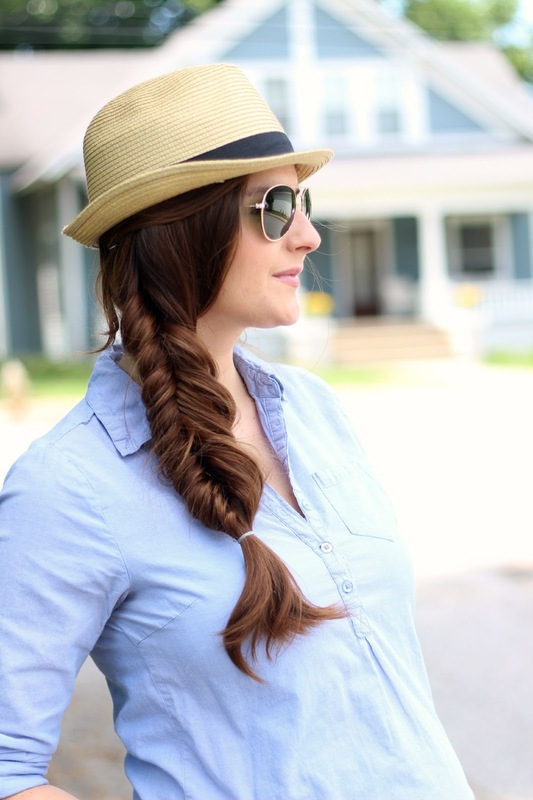 Black Jeans: PinkBlush Maternity c/o // Fedora: Forever 21 // Chambray (no longer available) loving this style and it's ON SALE! 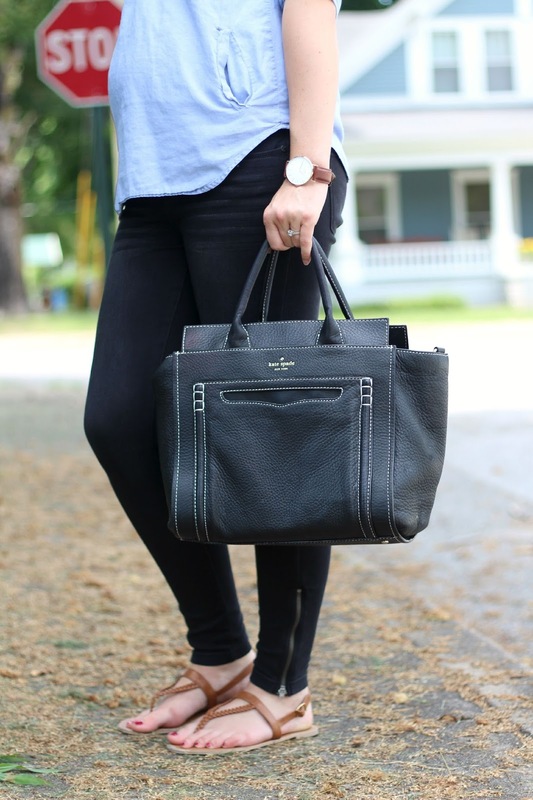 // Sandals: Old, but swooning over these // Glasses: ZeroUv // Watch: Daniel Wellington c/o // Bag: Kate Spade Claremont Drive Marcella (no longer available) but swooning for this very similar & will someone please buy me this diaper bag ?! Jake and I had such a lovely weekend. We didn't have too many nursery projects, so we just cleaned the house, ran some errands, and floated in the Lake for hours on Sunday afternoon. 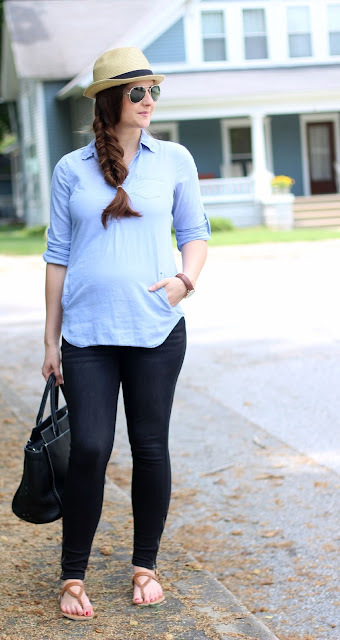 This outfit has really become my weekend uniform lately, as pants are pretty much a no-go for my big belly unless they are Pinkblush Maternity! I've been living in maternity dresses for a few weeks now, like this lacey beauty or the prettiest floral dress you've ever seen, so to say I have fallen in love with a pair of maternity jeans a BIG DEAL. 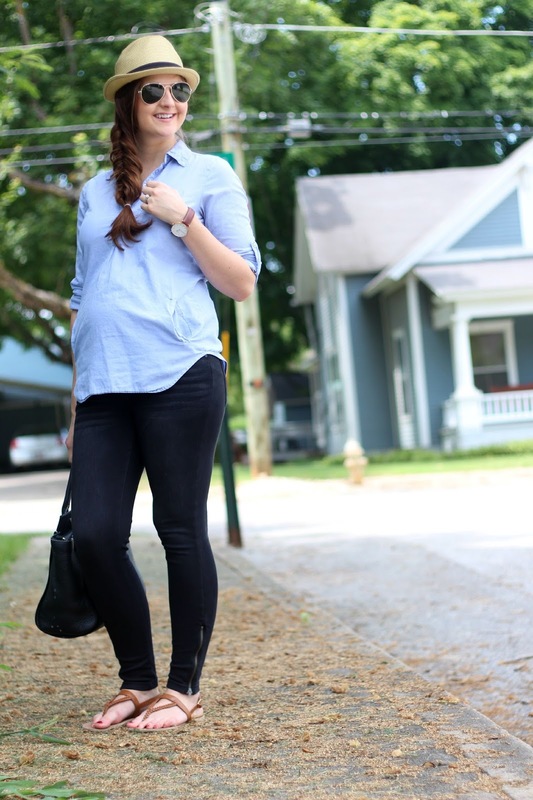 I love the black maternity denim because it really is versatile to go from work to weekend. I've worn them with small heels and a blazer to work, and I can throw on a light chambray top and some sandals for weekend errand running, and I still feel like i'm in comfy leggings throughout the day! I know I won't stop talking about how much i'm looking forward to cooler days, but really, I can't wait to pair these with a big comfy sweater in the weeks before baby S comes. Thank you, PinkBlush Maternity , for sponsoring this post. You look absolutely beautiful, Kylie! Thank you, sweet Meg! I died for your wedding photos! Such a beautiful outfit dear!! kisses! You are glowing, as always Kylie! You're making pregnancy look like a breeze! Oh man, you are the sweetest! It's been the hardest thing i've ever done, but i'm so glad you said that! Thank you, friend! Big tunics with skinny jeans is my favorite look right now! Hope you're having a great week!